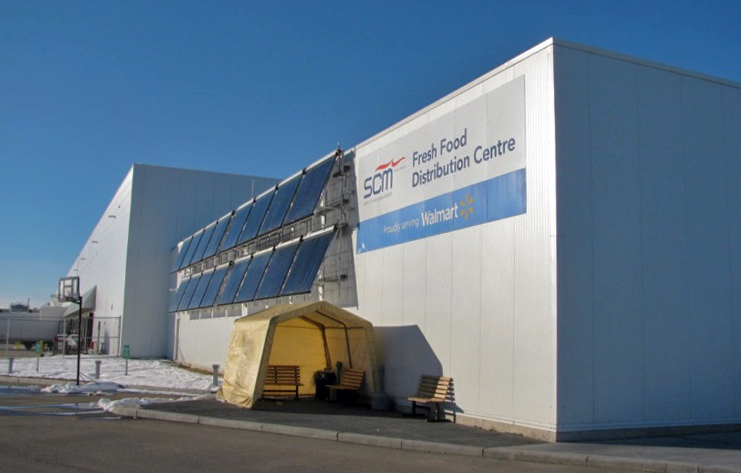 Challenge: A 400,000 square foot industrial building was needed by Walmart to function as a freezer and refrigeration facility and as a distribution centre for 104 stores in Western Canada. Our challenge was to meet the structural needs of such a massive facility in the most cost-effective way possible, factoring in long term durability and savings on maintenance and repair. Solution from McIntosh Perry: The building has a grade beam and caisson foundation due to local soil conditions, and the superstructure is a structural steel moment frame and braced frame construction. The building has a 37 foot building height for both freezer and refrigeration areas, with a high racking system for a modern logistic design. Long span joints are used throughout the entire warehouse area to increase column spacing, thereby reducing the number of columns used and increasing the amount of column-free space for operation. A joint-free slab-on-grade is used in the warehouse areas for durability and low maintenance. Impact: By having one larger and more efficient facility, Walmart estimates $4.8 million in energy savings alone. While we certainly can’t take credit for the green energy systems helping to provide power to the building, our structural solutions made it possible to construct a durable building of the right size and layout.